CANBERRA, Australia—Soccer pundits may think only divine intervention could save Australia from an early World Cup exit, but a huge inflatable replica of Brazil's "Christ the Redeemer" statue has gone down like a lead balloon with religious leaders and lawmakers Down Under. The 150-foot-high inflatable—urging Socceroos fans to "#Keep the Faith"—was hoisted over Melbourne by an Australian gaming company ahead of the World Cup squad's opener against Chile on Friday. 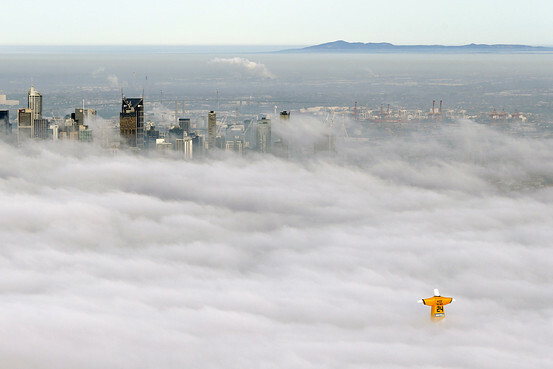 The giant balloon is modeled on Rio de Janeiro's famous mountaintop statue but wears a yellow Socceroos jersey with the company logo between its outstretched arms. "If they knew anything about Jesus, they'd know He'd be overturning tables in the gaming halls, because they're highly addictive and destroy lives," said the Rev. Tim Costello, an antigambling campaigner, on national radio. He accused the company, Sportsbet, of "arrogance and hubris." This is Australia's fourth World Cup and its third in a row, but the team is in transition after the retirement of stalwarts like Harry Kewell and Brett Holman, who scored two goals in the 2010 World Cup. The Socceroos' chances of hoisting the golden World Cup trophy are currently rated at 750-1 against, with many bettors tipping the team won't net a single goal in Brazil. 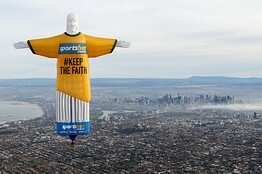 Sportsbet spokesman Matthew Campbell says the balloon, which stands 20-feet taller than the real statue atop Rio's Corcovado Mountain, is less about gambling than about sending a Brazilian-style message of support to the Socceroos, which lost 1-0 to Croatia in their last warm up match in Salvador. If the team defeats Chile, then it still needs results against World Cup holders Spain and 2010 beaten finalists, the Netherlands, to reach the knockout phase. "They are in the Group of Death. We think they might need some divine help," Mr. Campbell said. "We're asking Australians to keep the faith." Peter Ryan, the Conservative deputy premier of southeastern Victoria state where Melbourne is located, told Australian journalists that the balloon should be removed immediately from the skies to avoid further offense to the religiously minded. But Mr. Campbell said the balloon would keep flying despite the furor. "The only thing we're depending on is the weather," he said.